When you hear the word Japan the first things that generally come to mind are neon lit skyscrapers, geishas, sushi and of course Mount Fuji. After spending a month there in 2010 we knew there was a lot more to discover in this wonderful country. From stunning countryside to a rich cultural history, Japan is by far our favourite country to visit. What we didn’t know though is that Japan has a secret. Did you know that Japan has tropical islands? Neither did we. 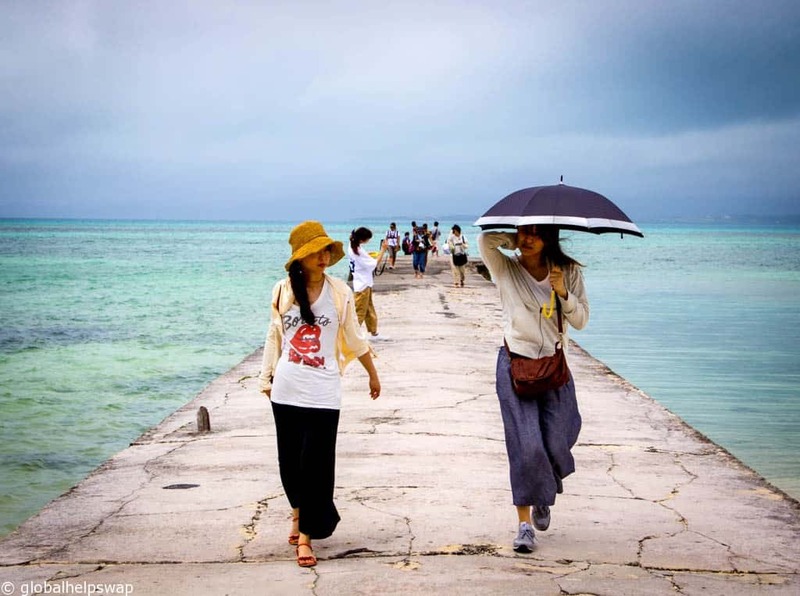 Welcome to the Yaeyama Islands, Okinawa, Japan’s tropical paradise. Where are the Yaeyama Islands? 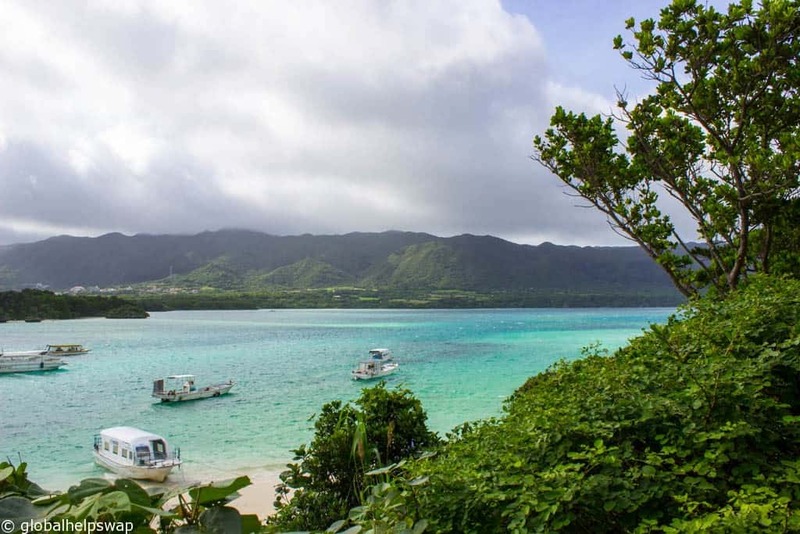 The Yaeyama Islands are in the province of Okinawa and are Japan’s remotest islands. In fact they are closer to Taiwan than they are mainland Japan. However, don’t let their remoteness put you off from visiting them. They are only a 3 hour flight away from Tokyo and they add the perfect antidote to bustling Tokyo. Early settlers to the Yaeyama Islands came from nearby Taiwan, The Philipines, China and even as far south as Thailand. Archaeologists have discovered pottery on the islands that match the style from Northern Philippines. Most settlers settled by the coast because of the sheltered bays and abundant sea life. The earliest mention of the island’s on mainland Japan was in 779 in the book of sui. During the 2nd World War, the United States invaded Okinawa with 185,000 troops. A third of the population was killed during the war. All nationalities are commemorated at the Cornerstone of Peace monument. 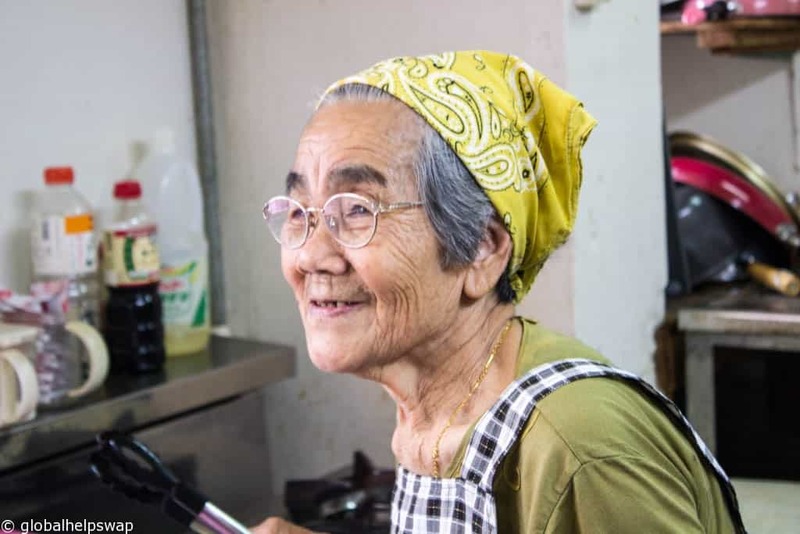 After World War 2, the whole of Okinawa was run by the United States for 27 years. Nowadays, the islands are known for their natural beauty, wildlife and diving. Ana and JTA Airlines fly directly from Tokyo Haneda Airport to Ishigaki Island the main transport hub for the Yaeyama Islands. Flight time is around 3 hours. You can also fly in from other major cities like Osaka, Nagoya and Naha. 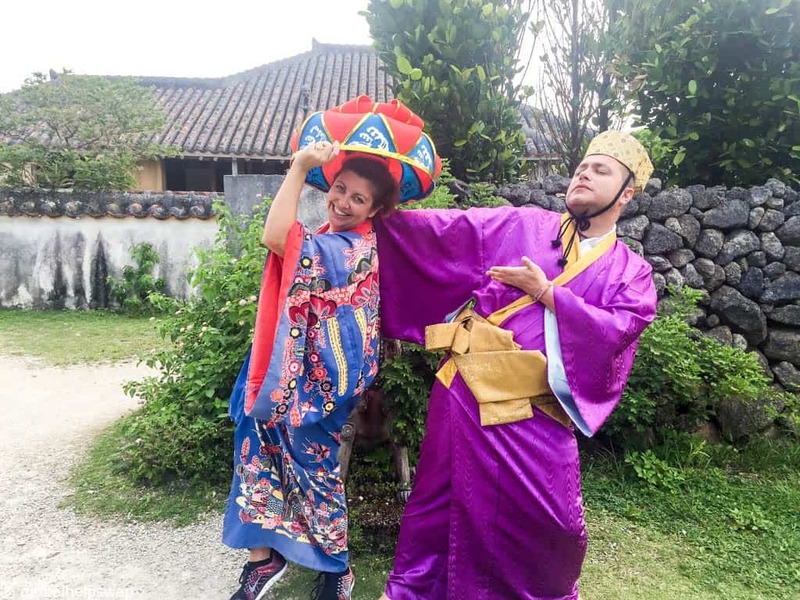 You could dress up in a local costume! Or sit under a waterfall! We visited 3 of the Yaeyama Islands; Ishigaki, Taketomi and Iriomote. 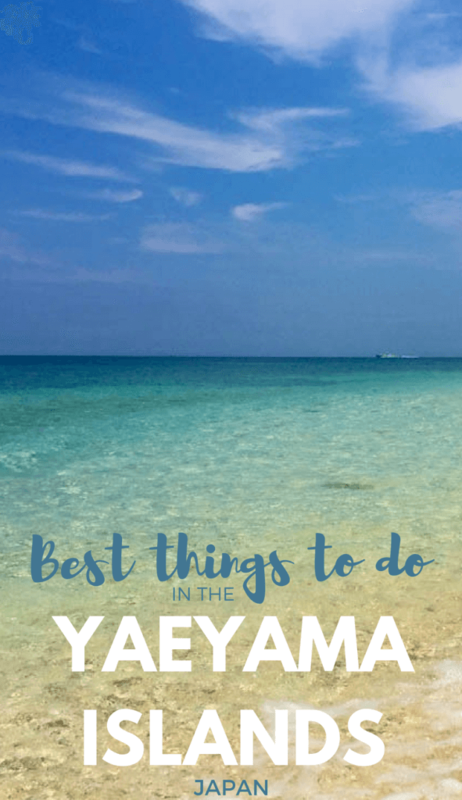 We will write more detailed posts on our time on the islands but for now, here are some activities not to be missed on the Yaeyama Islands. 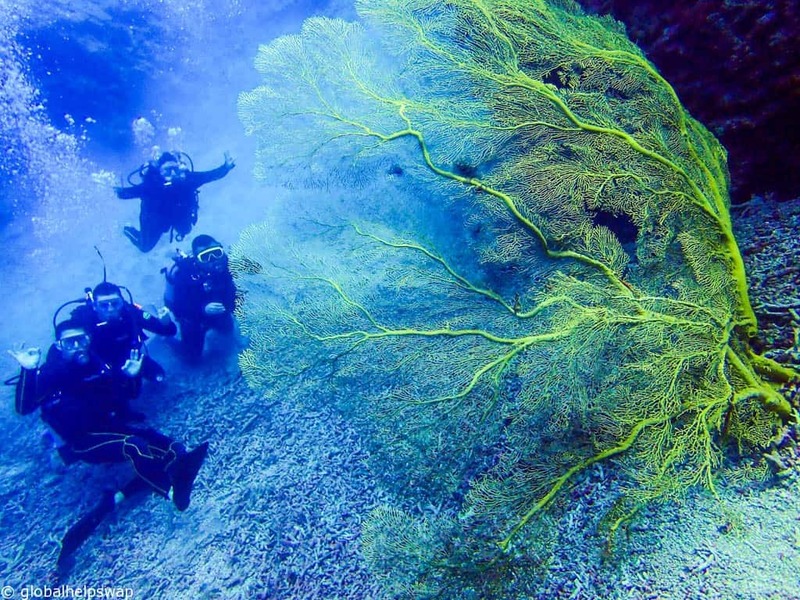 Scuba Diving / Snorkelling – We spent a wonderful day exploring the depths of the islands. The water is crystal clear and the diving was relaxed and easy. The highlight by far was coming across these 100 year old Gorgonian Fan Coral. They were beautiful and majestic. Trekking – We loved our day trekking. It was just the right side of hard, i.e. not too easy and not too hard. 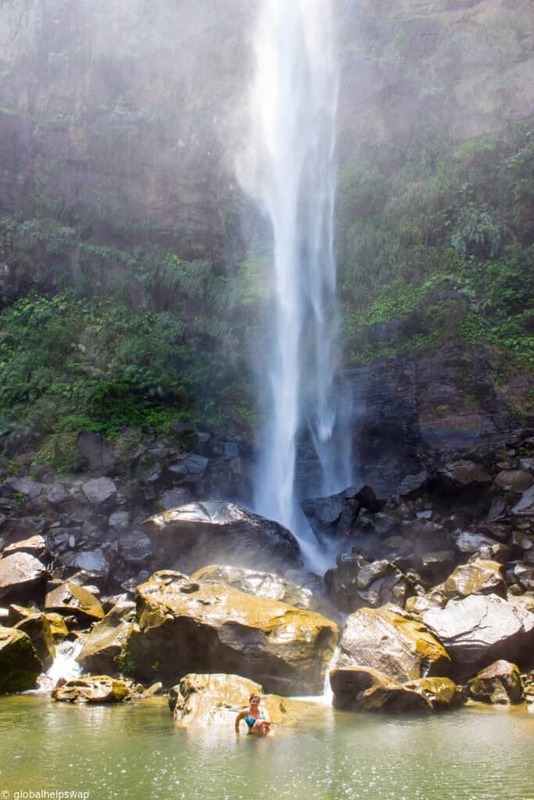 We first trekked to the base of a waterfall where we cooled off and ate lunch. It was as idyllic as it sounds. We then walked our lunch off by trekking to the top of the waterfall where the views were spectacular. Cycling – We cycled on Taketomi Island which has a population of 3oo. Needless to say there weren’t many cars to bother us whilst we cycled around the island! It was very easy to cycle around the flat roads and because the island is so small it’s easy to find your way around. Kayaking – We kayaked on the day we went trekking. I know, we were super active! It was a beautiful way to start the day as we kayaked gently down a river with mangroves all around us. 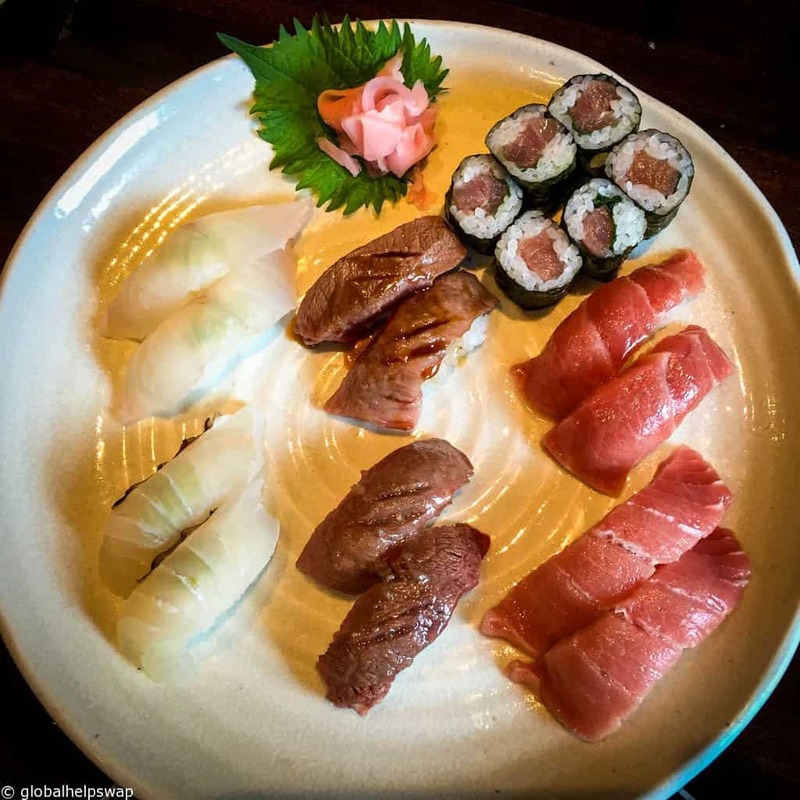 Eating and Drinking – Like everywhere in Japan, the food of the Yaeyama Islands is exceptional. Being tropical islands the fish and seafood is top class but so is the beef and wild boar. As I write this my mouth is watering. The local alcoholic drink is called Awamori which went down very well. It is made from long grain indica rice but unlike Sake it is distilled not brewed. 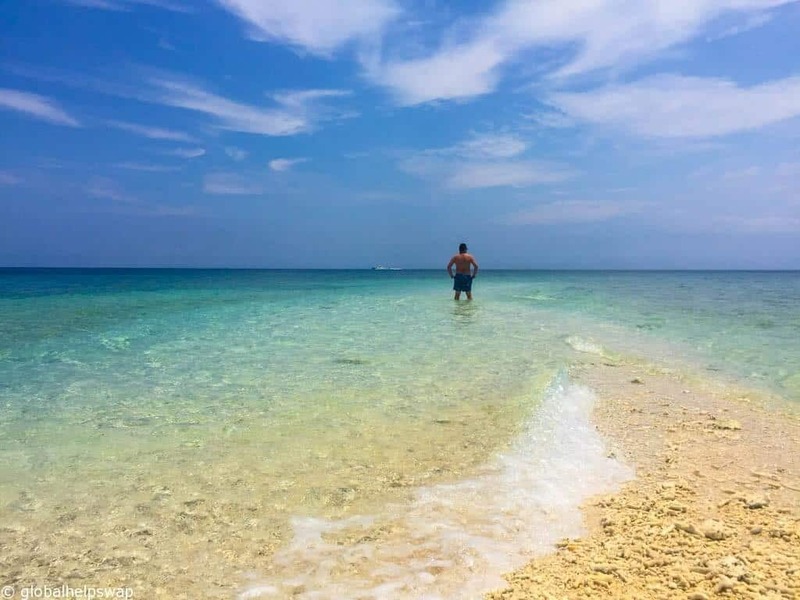 Ishigaki Island: We stayed at the Ishigaki Seaside resort right on the coast. 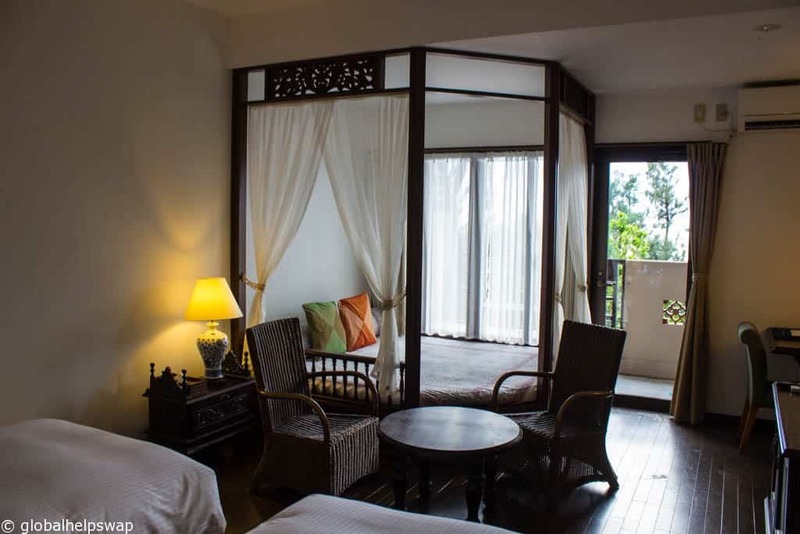 There are two sides to the hotel; the main building with rooms facing the ocean and the private bungalows where we stayed. 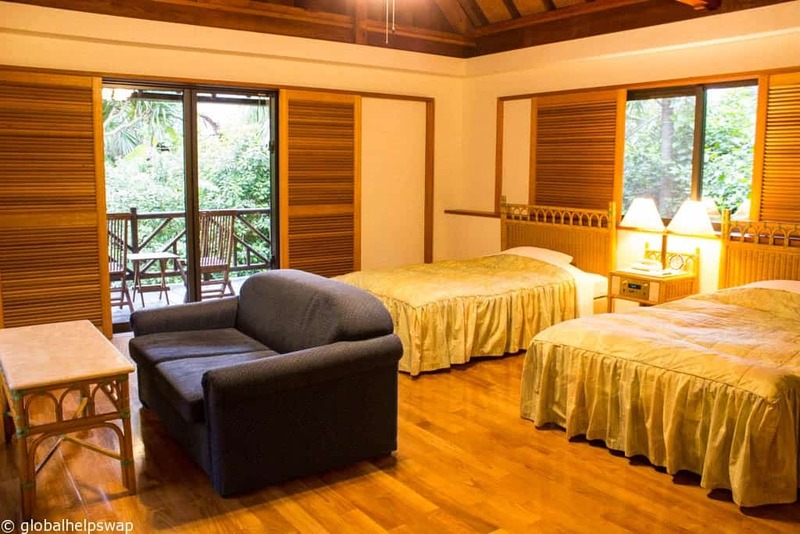 We have stayed in many bungalows in Asia and this one was one of the best we have stayed in. It was really big with loads of space to chill out. 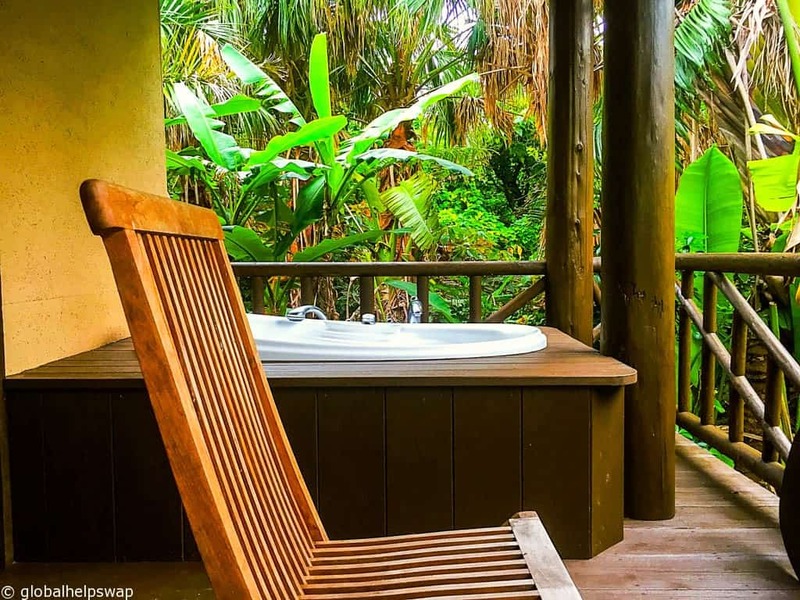 On the balcony there is a jacuzzi to soak all your aches and pains from trekking. 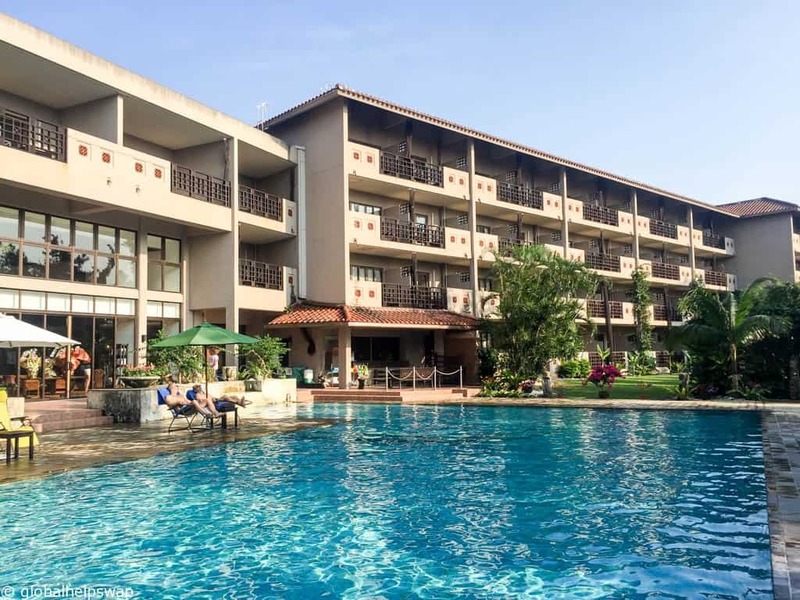 There is also a swimming pool, public baths, and watersports. 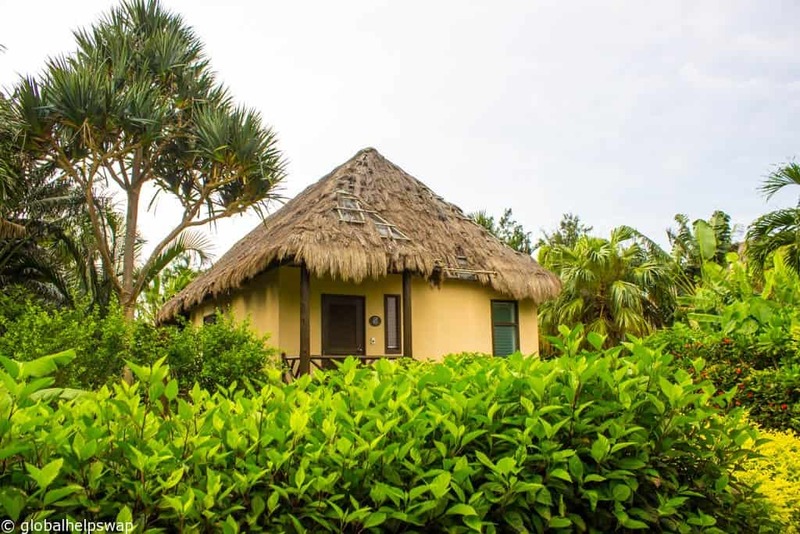 Iriomote Island: On Iriomote Island we stayed at the wonderful Nirakanai Resort. Again this is situated on a glorious beach with hardly anybody on it. This hotel has more of an industrial chic to it with lots of polished concrete and reclaimed wood. Our room overlooked the ocean with a daybed on the balcony. There is a swimming pool and spa and they can arrange snorkeling and diving from the main desk. As I said at the beginning, Japan is our favourite destination. There are many reasons for this. The food, the culture, the cities, the environment and the people to name a few. All of these reasons are even more relevant on the Yaeyama Islands. First of all, most of the islands are untouched. 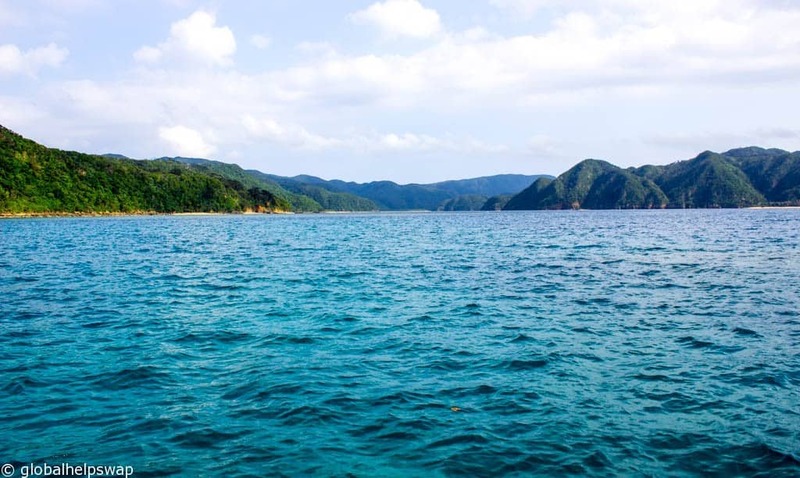 On Iriomote for example, 93% of the island is left for nature to take its course. The beaches and ocean of the islands are beautiful and empty. Imagine sitting on an empty beach without the hordes of people we get back home. Nice huh? 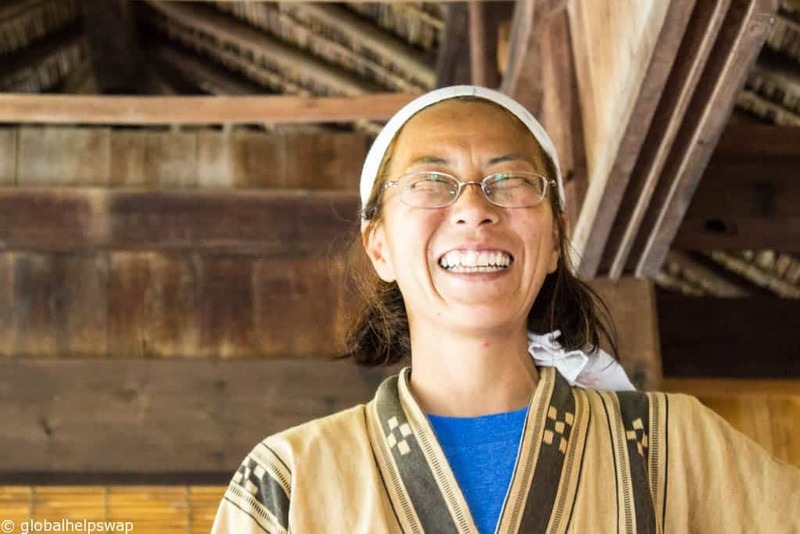 The people of the Yaeyama Islands are the friendliest bunch you will meet anywhere. They take great pride in where they live and they want to show the world how special it is. Then you have the trekking, the kayaking and the food. I could go on. The islands are a great add-on to your visit to Japan. You can tick the city box with Tokyo, Mountain box with Mount Fuji, Cultural box with Kyoto and Tropical box with the Yaeyama Islands. A perfect combination holiday. This is what happens when you have Awamori at 09:30! 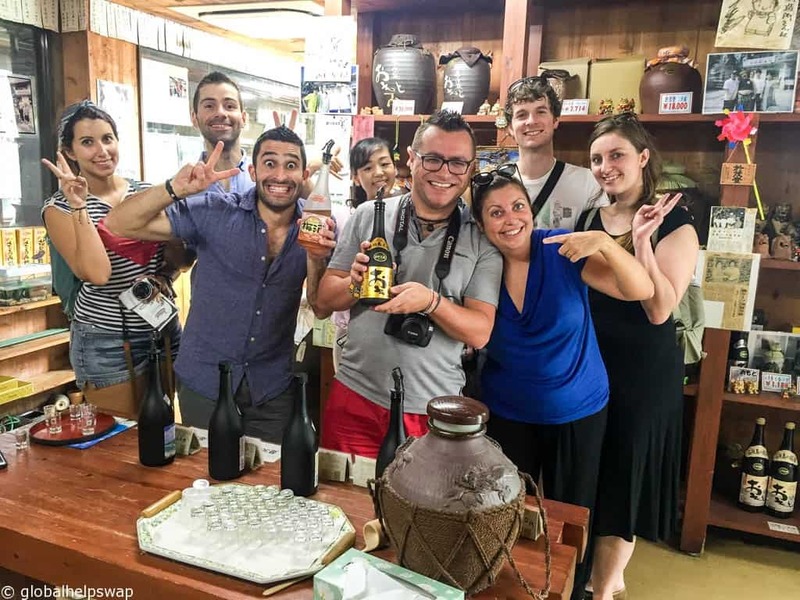 We were kindly invited to the Yaeyama Islands by Okinawa Tourism. As always, opinions are our own. Nice write up Paul 🙂 And love the photography.